Sleeping pads from Jack's Plastic. We're not twelve anymore and as a result, sleeping on the ground isn't what it used to be. And because we're rafting and not hiking, we can care about comfort instead of weight. That's why we carry Jack's Paco Pads, the world's most durable, comfortable sleeping pads. Made in USA, Paco Pads can literally be the difference between popping out of your bag to grab the first cup of coffee in the morning and wondering if you've got enough pain killers to get you back into your boat. 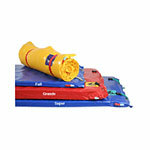 Jack's Plastic Full Paco Pad 1.5" x 24" x 72"
Jack's Plastic Grande Paco Pad 3" x 27" x 72"
Jack's Plastic Super Paco Pad 2" x 28" x 78"